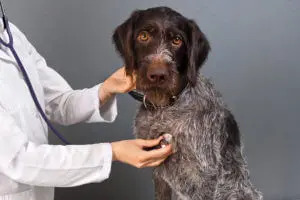 BluePearl Pet Hospitals are dedicated to providing pet owners with the tools and resources you need to ensure your pet receives the best quality of care. This includes preventative tips, health updates and helpful guidelines on basic care and administering of medications. Below are some resources and helpful tips from BluePearl’s medical team. For additional pet care resources, we recommend Partners in Animal Health. It is important to know the basics when it comes to your pet’s vital signs. This can help you assess your pet in an emergency situation and better prepare you for sharing important information with your primary veterinarian. The three main vitals that you want to be able to assess are heart rate, respiratory rate and temperature. This can be found by feeling the area where the elbow meets the chest and/or by feeling for a femoral pulse. You then count the number of beats for 15 seconds and then multiply that number by four. It is important to practice assessing your pet’s heart rate in a non-emergency setting. This will ensure you are comfortable locating the pulse when an emergency does arise. 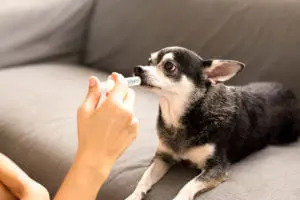 The temperature of a dog or cat is most accurately taken rectally, so obtaining a rectal thermometer to keep on-hand for your pet is recommended. The normal temperature of a cat or dog is 100.5 to 102.5. 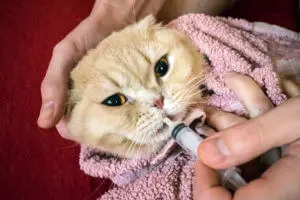 One of the biggest problems with successfully treating our animal patients is making sure that owners can actually get the medications into them. Cats in particular can be very difficult to medicate. I hope to give you some hints and suggestions that may make this tough job go better. The majority of dogs will take most medications in food. If your pet does not have dietary restrictions, I find that peanut butter or cream cheese, because they are sticky, are often a good way to hide medications. Many veterinarians also sell what are called Pill Pockets, a treat that you can pull apart and hide a medication inside. If your pet has a food allergy, please discuss what foods are OK to try with your primary veterinarian. If you haven’t given your pet medication before, please ask a member of the medical team to give the first dose for you and to demonstrate. This is often the most helpful way to learn. It also really helpful to make a calendar or checklist that you can mark when you give the medication so that you have a visual reminder about whether the medication was given or not. This is especially helpful if multiple people in the household are medicating the pet or if you are giving more than one medication. If you are having problems, always feel free to call your veterinarian for advice and assistance. Try and keep the mouth closed after the medication has been administered. This causes them to have to swallow. Follow the pill with water to help encourage them to swallow. Always try treats like peanut butter, cheese, and pill pockets. Keep their mouth closed and try blowing on their nose or rubbing the windpipe to promote swallowing. Always approach them from behind, not straight at them. Remember to always talk to your veterinarian before giving any medications or supplements to your pets. Our medical team can treat and stabilize your exotic pet in an emergency. We work with many of the exotic specialists in the area and can consult with them on emergency. Because our emergency clinicians do not specialize in exotics, we will make sure to coordinate and transfer care to your exotic family veterinarian as soon as your pet is stabilized. For additional pet health information, BluePearl recommends Pet Place. Pet 411: What Is Cushing’s Disease?